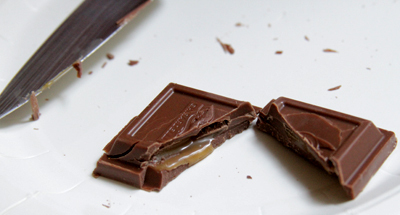 I picked this bar up on a whim, as I don’t usually gravitate toward caramel-filled chocolate. Well, the candy gods must have been smiling on me because this is one delicious candy bar. 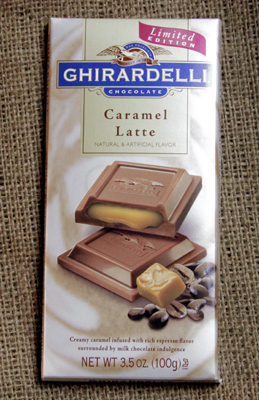 The packaging is classic Ghirardelli, with an illustration of the caramel-oozing chocolate atop a pile of coffee beans. Pretty standard packaging fare. The packaging color is dull metallic gold, signifying luxury and richness. 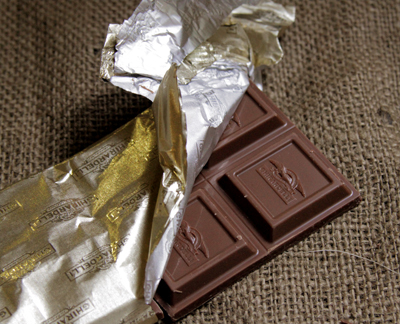 The chocolate is wrapped in a metallic gold foil wrap, again, traditional and signifying richness. The chocolate smells sweet with a very subtle caramel note. When you bite into it, the chocolate is smooth, and the caramel is sweet with a butterscotch note, and then a subtle aftertaste of coffee. And then the addiction sets in. This stuff is sooo good! One little square will do you, though (which is probably why Ghirardelli sells little chocolate squares individually packaged). You probably won’t want to eat more than one square in a sitting. The Ghirardelli fan in me was pleased when I ate this and it was the best.thing.ever. The Portland coffee-drinker in me didn’t think the coffee flavor was very pronounced. Of course, if you order a an actual caramel latte at your favorite coffee shop, the coffee flavor hides in all the sweetness and milk, too. I guess that means this candy bar is a lot like its namesake beverage. As a mother of three, I sometimes hide out in the laundry room for a two-minute break and sneak chocolate. We’ll call it Mother’s Little Helper. I will definitely stash a bar of this somewhere so I can eat a square on the sly whenever I need a little pick-me-up.